Turns out someone is sick of all the cat videos on Yuotu– sorry, Mewtube. He decides to get rid of them, and the entire network, by uploading a nasty virus! Your mission, unsurprisingly, is to guide it (or them) through various trials and tribulations, destroying more than a few computers along the way. At first, I wasn’t quite sure what to make of this game, since it seemed incredibly quirky and nonsensical. But as it turns out, that’s also what makes it so interesting and entertaining! I mean, what part of sending an army of odd-looking tiny colored creatures to infect “Mewtube” doesn’t sound like fun, really? And when was the last time you got to play a game that lets you destroy… feline computers? So lock your scepticism up somewhere and throw away the key, because it only gets weirder from here! 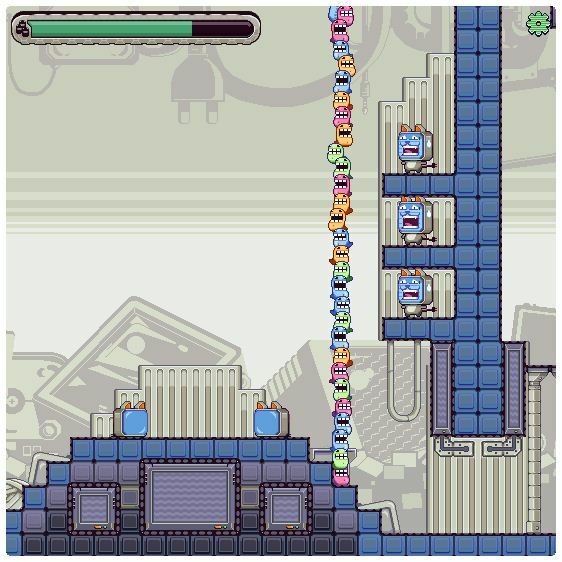 The whole thing takes place over the course of 15 levels, and while it’s almost too easy early on, the later stages will test both your patience and ability to maneuver a lot of oodlegobs at once! You see, these little buggers and move as a single unit, which at times makes platforming rather troublesome. Fortunately, ordering them around is an easy affair, with WASD used for movement and space to jump; getting them all across every spike pit safely… well, not quite as simple. 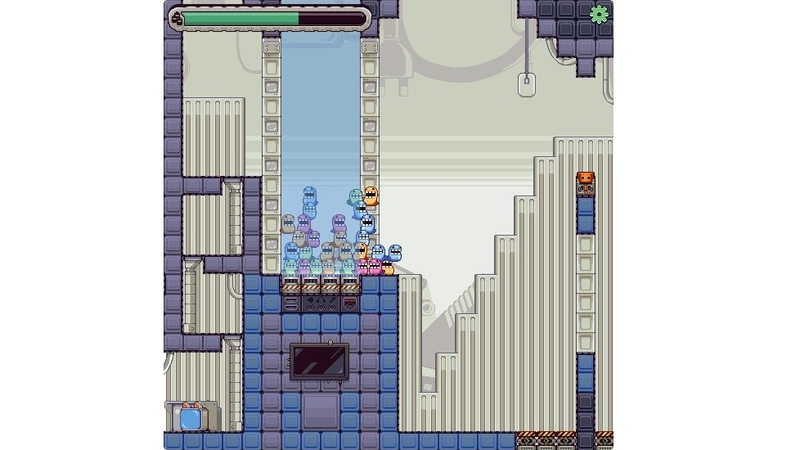 Since your entire ‘army’ moves in unison, it can be incredibly tricky to navigate the likes of moving platforms. Lining them all up to press switches in different locations at the same time is no walk in the park either. That said, it would certainly be much more troublesome without the “come here” and “build a tower” commands. The first enables you to ‘stack’ oodlegobs, while the other is a call out to gather the lot. Ah, if only they didn’t have a single-digit IQ… but that’s viruses for ya. Throughout each level, you’ll be dealing with lasers, TNT, springs, and other ‘fun’ hazards, along with all the platforming. Come to think of it, I’d recommend simply accepting the fact that some oodlegobs WILL die. It’s unavoidable. Ain’t a permanent vacation though, since each checkpoint brings the lot back to life, and teleportation beams deal with anyone left behind. But mark my words: there will be casualties. I’m sure you know that the nature of a virus is to multiply and cause as much damage as possible; this one is no exception. Each ‘terminal’ (or cat computer) demolished along the way spawns another oodlegob, and you’re gonna need every last one of them. Stacking the lot to reach certain platforms and/or switches requires a fair amount after all; in fact, just think of them as disposable building blocks. For the most part, I had little trouble reaching the huge computer at the end of each level, but… there were a few incredibly annoying spots. It was during these that I realized any gates I’d previously opened, actually remained open – even after reappearing at a checkpoint. Neat little trick, especially when laser beams are involved; yum, fried oodlegobs. It’s time to deploy an evil virus army against cats, so fire up your browser and take Oodlegobs for a spin. Right now. Destroy Mewtube! Just remember to mask your IP, or the Cat Police might come looking for ya.